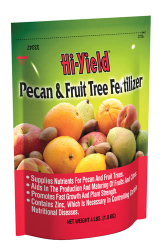 A complete fertilizer for nut and fruit trees, especially Pecans. Increases size and flavor of fruit and contains micro-nutrients to control nutritional diseases. For best results, apply in the spring before new growth starts and again in the fall after harvest. 1/2 lb. per 1/2 inch of tree diameter around tree drip line.